Home to the largest Muslim population in the world, Indonesia recently saw tens of thousands of its Muslims marching in Jakarta. Organizers called their movement a “reunion” for a series of rallies starting in late 2016 that targeted Jakarta governor Basuki Tjahaja Purnama, also known as Ahok, Jakarta’s first ethnic-Chinese Christian mayor, who was charged with insulting the Quran. The rally, which saw many dressed in white and carrying Islamic flags, was also attended by former general Prabowo Subianto who is running for president against incumbent Indonesian President Joko “Jokowi” Widodo. Next year’s election will be the second time both of them meet head on since 2014 where Jokowi, who is a Muslim by birth, won despite being bombarded with a series of smears aimed at his perceived lack of religious fervour. In 2016, Jakarta was mired in religious and political tensions. During that torrid year, Ahok lost his bid for re-election to Muslim rival Anies Rasyid Baswedan and was later sentenced to two years in jail for blasphemy when he allegedly misquoted a passage from the Quran. What is important to note is that Ahok is an ally of Jokowi. Observers have largely agreed that Islamic conservatism is on the rise in Indonesia and there does not seem to be an end to it in sight. 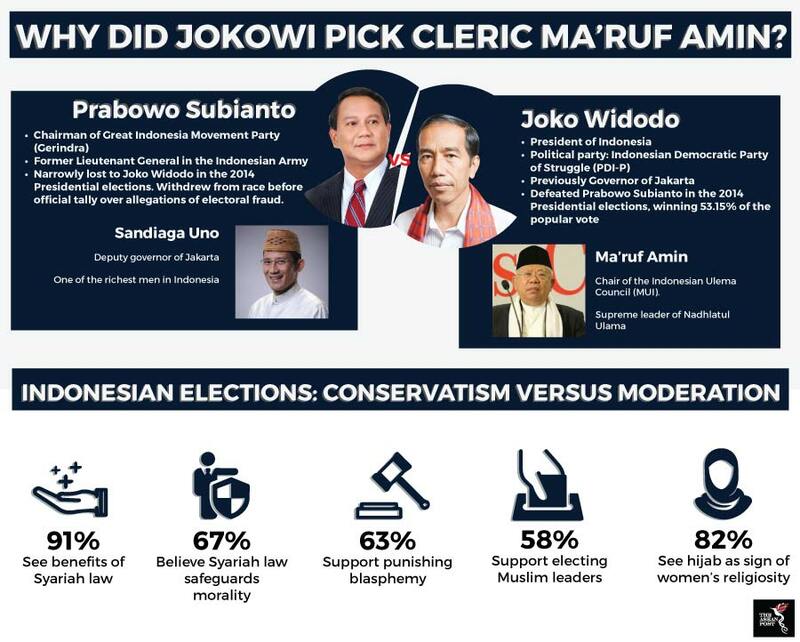 Most of the attention has been focused on Jokowi’s unexpected decision to appoint the 75-year-old conservative and controversial Islamic cleric, Ma’ruf Amin, as his running mate in the upcoming election. On the other hand, Prabowo seems – at least for a while – to be cultivating a more moderate and approachable persona. Nonetheless, Prabowo’s appearance in the recent rally should raise some eyebrows about his “moderation” strategy and begs the question as to whether he will use anything at his disposal - including a growing religious conservatism - to win in the coming election. In fact, Ray Rangkuti, an Indonesian political analyst, believes that political figures in the country are increasingly willing to find common ground with conservative and even extremist Muslim organizations in pursuit of their personal political gains. "Religion is being used by Indonesian politicians as a means of winning elections. This is even more dangerous than money-driven politics," he added. Jeffrey Kenney, professor of religious studies at DePauw University, goes further to say that conservatism and political intentions are, in fact, interlinked, adding that in authoritarian settings, governments incline towards conservatism to prove their religious legitimacy to the masses, which tend to be more conservative than liberal. “Such governments are more often than not secular, but religious conservatism provides a good public cover,” he told The ASEAN Post. But it isn’t just Prabowo that Jokowi needs to look out for. Recent news reports have revealed that firebrand cleric Habib Bahar bin Ali bin Smith, popularly known as Habib Bahar Smith or Habib Bule, had been reported to the Jakarta Metro Police for defaming Jokowi through some very troubling remarks he made about the Indonesian leader in a sermon. Videos of the sermon went viral recently. While Habib has been apprehended, the fact that an ultra-conservative cleric defamed Jokowi in a sermon hints at the possibility that Jokowi’s strategy of going with Ma’ruf as a running mate has not appeased all Islamic conservatives in the country. While smear tactics were commonplace during election campaigning prior to the 2014 election, local and foreign observers had agreed that the intensity and persistence of attacks on Jokowi during that campaign period were unlike anything Indonesians had witnessed before. Social media and tabloid papers were abuzz with rumours and allegations against the man once dubbed as “Indonesia’s Obama”. Allegations included claims that Jokowi’s mother was an alleged activist with the banned Indonesian Communist Party. Some groups like the Forum of Islamic Society (Forum Ummat Islam) even went as far as to say that it was forbidden for Muslims to vote for Jokowi. Four years later and conservatism has continued to sizzle in the “Emerald of the Equator”. While human rights defenders may be concerned about Jokowi’s decision to appoint Ma’ruf Amin, the question is what else could he have done? Even with Ma’ruf at his side, Jokowi continues to be an easy target for several conservative Muslim groups. Being once affiliated to Ahok will most likely be fresh on many of their minds especially following the recent rally commemorating Ahok’s fall from grace and subsequent arrest. If Jokowi barely scraped past the post in 2014, then 2019 will be even more challenging for him. Deciding not to “gamble” with someone like Ma’ruf as running mate could likely have proven more costly for the president. Meanwhile, Prabowo looks on with ever-watchful eyes. Why did Jokowi pick cleric Ma’ruf Amin?